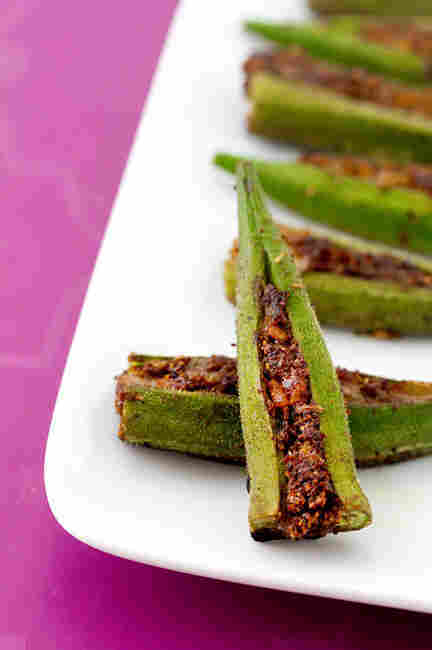 Kitchen Window: There's More To Okra Than Frying If you've had a slimy dining experience with this slender green vegetable, have no fear: Food writer Monica Bhide shares her grandmother's slime-busting tips, plus recipes that go beyond the traditional Southern fried fare. Okra, I clearly recall, was the first vegetable that I learned to cut. I remember it so well not because I loved it — although I did — but because of the slime. The mucilage that was excreted from the unassuming little pod was almost enough to turn me off my favorite vegetable. Almost. Luckily for me, my grandmother intervened and showed me how to cut okra so that I could get rid of the offending slime along the way. Alas, my deep-frying began to catch up with my thighs, and ... Thus began my quest to find a way to cook okra that was healthy and heart-friendly without being, simply put, gross. Don't get me wrong, I can eat it in a curry, but I really have this thing about the slime. And I know I'm not alone. She made a few simple rules for me to follow: First, use tender, small pods (the large ones are hard as wood and cannot be eaten, slime or no slime). Second, rinse and thoroughly dry the okra. Next, she recommended that I cut off the tops and bottoms. I have no scientific evidence to support her assertion that this reduces the slime, but when grandmothers — especially ones who cook like a dream — assert anything, grandchildren listen. The next part, cutting the okra into pieces, does in fact release the slime. But she taught me to keep a small towel on the side and to religiously wipe my knife after each cut. This keeps the slime on the towel and away from the okra, so when you cook it, it is considerably less slimy. I have to admit, the slime has its uses. 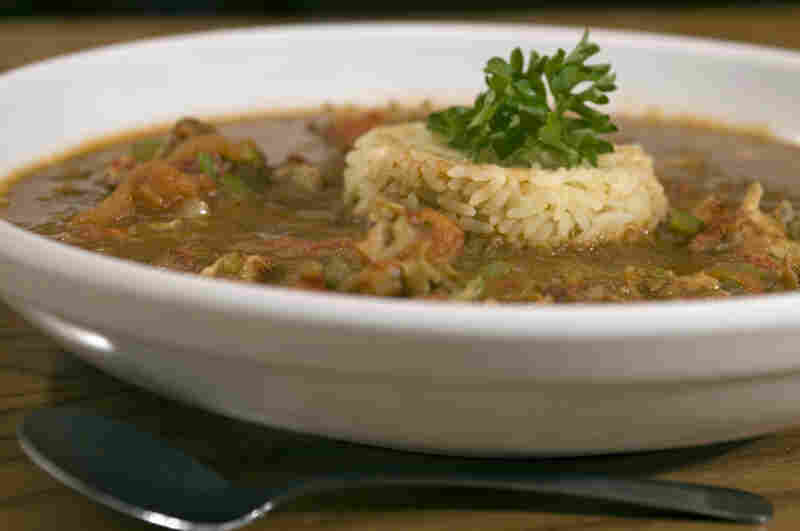 In some of my favorite dishes, such as Southern American gumbo, all that slime comes in handy as a thickener. African slaves are said to have brought okra with them to the South. Alternatively, gumbo is also made with file, ground dried sassafras leaves that thicken the broth. 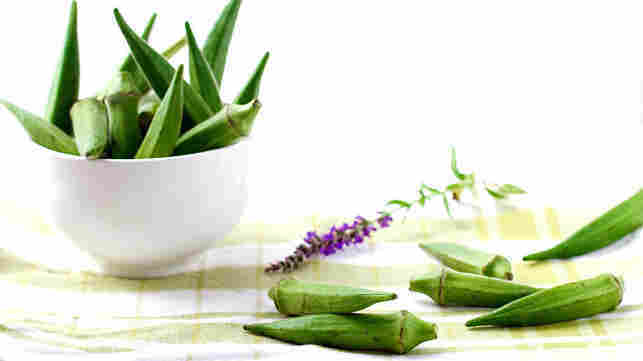 In India, okra also is used as a thickener in certain curries. 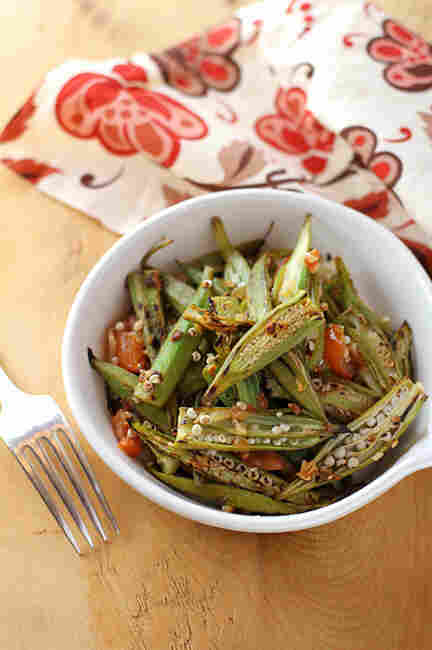 Of course, no one there calls it okra; it is called lady's finger. My grandmother's final and most crucial tip was to cook okra on high heat, which I translated into: If you want to have great-tasting okra, deep-fry it on high heat. An engineer turned food writer, Monica Bhide writes about food and its effect on our lives. Her work has appeared in The Washington Post, the New York Times, Food & Wine, Prevention, Cooking Light, Health and Self. Her latest book is Modern Spice: Inspired Indian Flavors for the Contemporary Kitchen (Simon & Schuster). Read more at her website. So I grew up frying a lot of okra. I sliced it into thin rounds and pan-fried it with spices, onions, tomatoes and a lot of oil. I julienned it, coated it with a mix of chickpea flour, ground roasted cumin, salt, pepper, cayenne and ground coriander and deep-fried it. The texture was crunchy, the spices added depth, and there was zero slime to deal with. Alas, my deep-frying began to catch up with my thighs, and I wondered if my okra-eating days were over. Thus began my quest to find a way to cook okra that was healthy and heart-friendly without being, simply put, gross. Don't get me wrong, I can eat it in a curry, but I really have this thing about the slime. And I know I'm not alone. I began to question my assumption: While Grandma had said to cook it on high heat, she never said to cook it only on the stovetop in super-hot oil. So when I started roasting vegetables in the oven at very high heat, I wondered if okra might be a candidate. For my roasting experiment, I selected tender pods, as Grandma advised. A long time ago, I tasted okra "chips" that had the top cap and the bottom left untouched, so I decided not to chop them off. I rinsed the okra and let it air-dry for a few hours. Then I felt guilty about not listening to granny's advice, and off went the tops and bottoms of the okra. Then I marinated it in a little oil, salt and pepper. I roasted it in a 415-degree oven for about 40 minutes (tossing it around every 15 minutes or so to ensure that it browned evenly on all sides). It tasted, well ... good, but the earth did not move. It needed something more. It was then I turned to chaat masala, the love-of-my-life spice mix. Simply translated, chaat means "to lick," and my contention is that this spice blend makes everything lickably good. Chaat masala sells for a dollar and change at most Indian grocers and is my favorite condiment. I sprinkled some on the roasted okra, and it took the dish from simple to spectacular. I made another batch and sprinkled it with my fennel-red chili spice rub. I think my grandmother would be proud that I have enlarged my okra world. This simple but delightful recipe is adapted from Sala Kannan, one of my favorite vegetarian food bloggers. For the spice mix, heat the oil in a small skillet over low heat until it shimmers. Add the remaining ingredients. Fry just until the spices turn slightly darker and you can smell their wonderful aroma. Transfer the spices to a plate to cool. Grind to a fine powder in a spice or coffee grinder. For the stuffing masala, fry the onion and garlic in the oil in the skillet over medium heat, stirring occasionally, until the onion is soft and golden. Remove from heat. Stir the spice mix, turmeric and salt into the onions. Mix well and salt to taste. Wash the okra and pat dry. Cut off the stem end. Using a sharp knife, make an incision in the okra, starting at the stem end and stopping just before the point. Do not cut all the way through the okra. It has to be one whole piece. Place an okra pod on a work surface. Pry open the slit with one hand, being careful not to tear it all the way through. Using your other hand, gently stuff a little of the masala into the slit and pack it down. Repeat for all okra pods. Heat the oil in a large, shallow nonstick skillet over medium-high heat. Add the stuffed okra in a single layer, stuffed side facing up. Cook until the bottoms of the okra pods are brown. Reduce the heat to low. Cover the skillet, venting it a little, and cook for about 7 minutes, until the okra are tender. Remove the lid, carefully flip the okra over and cook 2 more minutes. Sprinkle with salt to taste. Serve hot. "Okra is often discriminated against because of its very nature," writes cookbook author Martha Hall Foose. "Soaking the okra and flash-frying thin strips produces a crisp, tender side dish that has none of the offending slime often associated with this delectable vegetable." This recipe is adapted from her book Screen Doors and Sweet Tea (Clarkson Potter 2008). Combine the water, vinegar and okra in a large bowl. Soak the okra for 1 hour. Drain and pat the okra dry. Using a sharp knife, cut the okra lengthwise into thin strips. In a large skillet, heat the oil over high heat. Add the onion and red pepper flakes, and cook, stirring, for 2 minutes or until the onion is soft and golden. Stir in the garlic and cook for about 1 minute more; do not let the garlic darken. Using a slotted spoon, scrape the onions onto a plate and set aside. Stir-fry the okra in the skillet until tender, 3 to 5 minutes. Stir in the tomato and onion. Cook and stir for 2 minutes. Serve immediately. A friend once told me that what separated the United States was not the Mason-Dixon line but okra. So when New Orleans native Chef David Guas opened Bayou Bakery in Northern Virginia, I was there on opening day and ordered the gumbo. It was an explosion of taste in each sip. I requested the recipe, and the chef very kindly shared. Don't let the long list of ingredients scare you. The soup is really simple to make. As the chef suggests, make a large pot and share it with friends. To make the roux, combine the oil and flour in a heavy skillet. Cook over medium heat for 20 minutes, stirring constantly, until the roux is dark brown and smells toasty. Be very careful not to let the roux scorch. Stir in the onion, celery and garlic. Cook 10 minutes, stirring often, until the onions begin to soften. Transfer the mixture to a deep Dutch oven or heavy stockpot. Stir in the chicken broth, tomatoes, okra, Worcestershire, hot sauce, bay leaves, parsley, thyme, basil, oregano, sage and pepper. Simmer for 2 hours, stirring occasionally. Add the shrimp, oysters, crabmeat and fish and simmer 10 to 15 minutes, until the seafood is just cooked through. Remove and discard the bay leaves. Serve the gumbo over cooked rice in deep bowls. If desired, sprinkle with chopped parsley.